RED Hill have secured their fifth consecutive win in MPNFL Division Two football, continuing their rampaging run with a big win over Hastings. Hasting started well and kept in touch with Red Hill in the first quarter, but the game would not stay competitive for much longer. By the three-quarter time break, Red Hill had established a comfortable 32 point lead and put the game to rest. A six goal to one final term only made the pain worse for Hastings as they went down in an uncompetitive clash 7.5 (47) to 17.7 (109). Chris Irving and Jonathon Ross both starred with six goals each for Red Hill, with their side sitting comfortably at fourth spot on the ladder. At Ballam Park Reserve, Karingal flexed their muscle with a dominating victory over Crib Point. A six goal to two first quarter set the tone for a completely one sided game, with Karingal dominating their lowly Crib Point opponents. It was a complete team performance for the Bulls, who had eleven individual goalkickers throughout their side. The win sees Karingal secure second spot on the ladder, as they claimed an astonishing 98 point victory 20.13 (133) to 5.5 (35). At Bunguyan Reserve, 11th placed Tyabb hosted ladder leaders Dromana in a match that looked uncompetitive on paper. Despite coming in as massive underdogs, the Yabbies raised eyebrows by battling hard in the first term, and they even went into the quarter time break with a narrow one point lead. 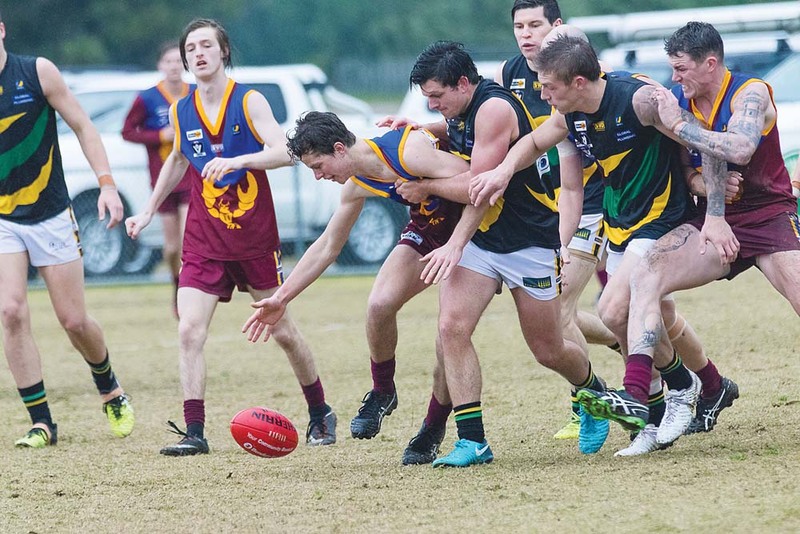 A shell shocked Dromana came out in the second quarter determined to make amends for their sloppy first term, as they tightened up in defence and held Tyabb scoreless for the quarter. Dromana continued to make life miserable for the Yabbies, who could only manage one more solitary goal for the remainder of the game. Despite the early scare Dromana battled back well to show their quality and secure a comfortable victory away from home. The final score was 2.11 (23) to 11.11 (77) in Dromana’s favour. Elsewhere at Glover Reserve, Chelsea put on a clinical performance as they continued their good season against Devon Meadows. Devon Meadows looked as if they might send their fans home with smiles on their faces after an impressive first term, going into the first break with a two point lead. After the first break, the Seagulls kicked things up another gear by holding Devon Meadows goalless in the second term. With a comfortable 16 point buffer established, Devon Meadows had been put on the back foot, and they struggled to work their way back into the game. Regular goalkickers Jack Francis and Curtis Bywater contributed for Chelsea with five goals between them, as their side claimed the four points with a 9.8 (62) to 13.11 (89) win. At RJ Rowley Reserve, Rye heaped more misery on a disappointing Pearcedale season by claiming a comfortable 51 point win. Pearcedale looked up to the contest up until half time, as they only trailed by a mere three points at the main break. After half time, Rye quickly put the game to bed with an impressive five goals to zero third quarter. Rye were a little more competitive in the final term, but could not bounce back from their disappointing third quarter, as they went down to Rye 14.16 (100) to 7.7 (49). Ben Trivett and Leigh Morse were among Rye’s best, as they kicked two goals each in impressive performances. Struggling Pearcedale are set to receive a welcomed boost, with former North Melbourne and West Coast Eagles tall forward Drew Petrie scheduled to play for them in a one off appearance against Devon Meadows at home next Saturday. Pearcedale also recruited Barry Hall for a similar cameo appearance last season. In the final game for the weekend Somerville hosted Langwarrin at Somerville Recreation Reserve. Langwarrin came into the clash full of confidence, coming off a big victory over Tyabb last weekend. Led by star goalkicker Jesse Murphy, they established an early lead and kept Somerville out of reach for most of the day. Murphy booted six goals to take his tally for the year to 46, as his Langwarrin side secured the win 7.12 (54) to 9.12 (66). Langwarrin now sit in sixth place on the ladder after an inconsistent season so far. They sit six points behind fifth placed Hastings, and will need some results to go their way before climbing up the ladder.